3.6 out of 5 based on 52 bloggers and 4 commenters. 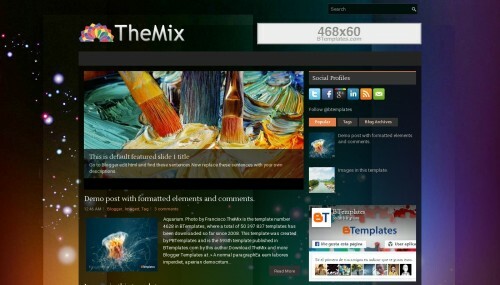 TheMix is a free blogger template adapted from WordPress with 2 columns, responsive design, right sidebar, fresh look, ads ready, footer columns, slider, social bookmarking icons, posts thumbnails, tabs, breadcrumbs, a background pattern, related posts support, abstract, 3D effect and gradients. Excellent template for blogs about art, to write a diary, fantasy, games, music or a personal portfolio site.